Tourism Ireland eNewsletter for Discounts, Deals and Offers on Places to Stay, Eat & Enjoy! Before planning a trip to Ireland, make sure you sign up for the eNewsletter from Tourism Ireland. It’s full of essential information from across the Emerald Isle, providing top-tips and exclusive discounts on events and activities. It’s full of unusual places to visit as well as the popular tourist sights. It not only shows the best places to go, but the best time of year to visit, and includes a handy traveller check-list so you can tailor your perfect holiday or short break. There’s special discounts on accommodation, which includes self-catering, bed and breakfast, hotels, caravans, camping, as well as historic houses. Exclusive travel deals and advice on flights, ferries, coach tours and car rentals mean you can plan your holiday stress-free. From kayaking in Kerry, to exploring the Burren by bicycle, there are endless ideas in the eNewsletter to keep all the family entertained. For the more adventurous among you why not try activities such as mountain biking, horse riding, walking and coasteering! The newsletter understands that surfing’s not for everyone. It recommends cookery schools – even knitting trips around Southern Ireland. They offer picnic and poetry breaks in County Sligo, where W.B. Yeats is said to have got most of his inspiration from. The eNewsletter provides information on many unusual trips, including royal burial grounds, castles, prehistoric tombs from the stone-age, even ghost bus tours in Dublin! As well as discounts on walking tours, you can even travel by pony and trap. Game of Throne fans can get special discounts, pick up a camper van and drive around Northern Ireland exploring the area the TV-series was filmed in. The eNewsletter is a must for anybody interested in tracing their Irish roots. Their visitor centre is full of helpful information and guidance to put you on the right path. Sign Up to your Tourism Ireland eNewsletter and enjoy Ireland for less! West Norfolk Visitor Guide – UK holidays at their best! Make the most of West Norfolk with the official West Norfolk visitor guide – discover all the sites, attractions and fun that there is to see. West Norfolk is a truly special place of unrivalled charm and natural beauty. The fine Victorian seaside resort of Hunstanton is a deservedly popular place from which to explore West Norfolk. It can seem almost timeless in its elegance and grace, but that doesn’t stop it being a firm favourite with families. After all, who couldn’t love a place where crazy golf courses for the kids – yes, including the big kids, Dad! – sit alongside stunning striped cliff faces? Our West Norfolk visitor guide will help you pick out those must-see spots, so you can relax in the evenings on the Blue Flag beach and watch Hunstanton’s truly stunning sunset. Nearby, you’ll find the village of Old Hunstanton, a world away from the crowding and bustle of the rat race. If you want to explore the countryside, the ancient town of Downham Market is a great place to start – a haven for lovers of wildlife, peace and tranquillity. West Norfolk is an ideal place to explore, unwind and experience the sheer sense of space and calmness. The West Norfolk visitor guide/brochure is a great resource for any holiday to Norfolk as it provides advice and direction on where to find quality accommodations, quality attractions, places of interest, travel information, and much more. The coastline is amazing to explore, featuring sandy beaches, broad horizons and some great natural habitats. West Norfolk has an outstanding coastline and beautiful rolling countryside with wonderful walking routes that many people come back to, even taking their bikes to explore the countryside. There are also great places for horse riding. West Norfolk is known throughout Britain, offering special environments, including some of the finest nature reserves in the country and opportunities for bird watching. The water way networks of the Fens is a great place for fishing enthusiasts to visit, in addition to the fishing opportunities available along the coast. Golfers are also well catered for with about nine golf courses located in West Norfolk. West Norfolk visitor guide to attractions provides ideas of places to visit, including details of sports and activity centres, wildlife attractions, and places of fun for all the family. The guide also provides information on the historical and heritage sites to enjoy, from historic houses, castles, museums, parks and gardens. West Norfolk brochure comes in handy providing details about the famous performances that occur throughout the calendar, like one at the Festival Town of King’s Lynn to artist’s work inspired by the architecture and landscape of West Norfolk. 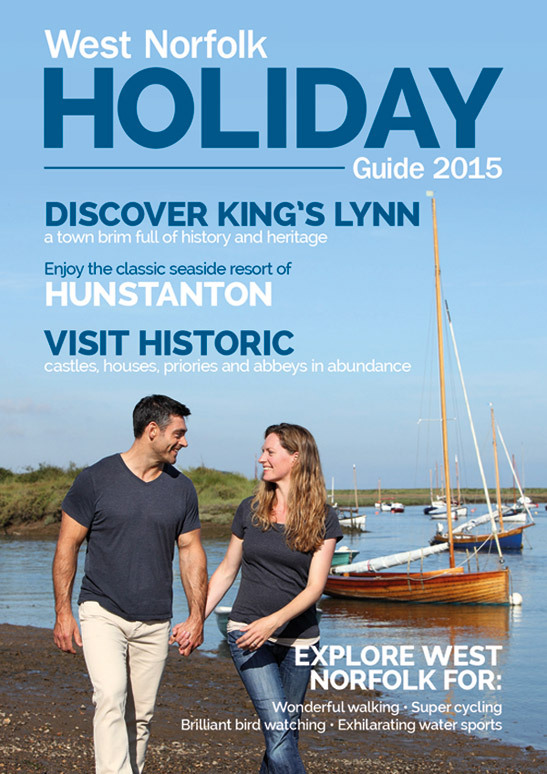 Order the West Norfolk vistor guide now for holiday ideas. Swanage & Purbeck lies on the south coast of Dorset and offers stunning coastal and country scenery. Visitors can enjoy the Blue Flag sandy beach at the traditional Victorian resort of Swanage or the more rugged beach at Studland; walking along the South West Coast Path gives breath-taking views over the coastline. The area is also the eastern gateway to the Jurassic Coast – Lulworth Cove and Durdle Door are key features of the World Heritage Site. Durlston Country Park is a perfect place to appreciate the area’s rich wildlife as is Wareham Forest, where the Sika Cycle Trail offers a safe off-road cycling environment. Purbeck also has a wealth of family attractions including Monkey World and The Tank Museum and was the inspiration for many of Enid Blyton’s novels. Sign up to the North Norfolk eNewsletter for special offers and news! Visit North Norfolk – North Norfolk is known for its ever-changing coastline and dramatic skies. Much of the coastline is designated an area of outstanding natural beauty and is internationally known for its wildlife. From Holkham Bay with its pine-fringed beach in the West to Happisburgh and Sea Palling in the Easty, North Norfolk’s coastline has something to offer everyone. An area set apart in its location and character, North Norfolk is found at the farthest eastern reaches of England. A good road network connects it to Britain’s motorways, and there are rail and coach links from most parts of the country. Trains run on the Bittern Line from Norwich to Sheringham, passing through Wroxham, North Walsham and Cromer on the way. Norwich Airport is within easy reach. With a unique mixture of fascinating history, a bustling quay and stunning beaches including Britain’s best beach, Sandbanks, a visit to Poole is a must in 2013. Poole’s stunning natural harbour and striking peninsula is the largest in Europe, providing the perfect location for watersports. The superb environment is rivalled only by its spectacular summer events programme, top attractions and a great dining scene. Poole Quay provides a great base to just sit back and watch the visiting tall ships, luxury sunseekers and fishing vessels. Enjoy the views across Poole Harbour with one of the many harbour cruises available or set sail for the National Trust’s Brownsea Island. You will find a variety of fine dining restaurants and a selection of top quality pubs and cafes both on and surrounding Poole Quay. Poole is a town rich in history and has a beautiful Old Town to explore. Use the cockle trail leaflet available from Poole Welcome Centre to find out more about this area. To experience the towns unique and colourful past make sure you visit Poole Museum (free entry) close to the quayside. 2013 plays host to Wave 105.2FM Summertime in the South spectacular events programme, visit Poole Tourism for further information. Exciting events, a bustling quayside, exhilarating watersports and a stunning beach to rival any abroad, Poole is the perfect location for your holiday! Portsmouth, the great waterfront city, has miles of sea views and centuries of history. With more than 800 years of naval history, Portsmouth’s world renowned Historic Dockyard is a must-see. Featuring HMS Victory, The Mary Rose Museum and HMS Warrior 1860, along with the National Museum of the Royal Navy and Action Stations, this attraction offers a full day’s visit. A brand new Mary Rose Museum will open early 2013, reuniting the Mary Rose hull together with her collection of artefacts, placed in context, in a brand new boat shaped Museum. Enjoy spectacular views from the iconic Spinnaker Tower, soaring 170 metres above Portsmouth Harbour and the Solent, taller than the London Eye, Blackpool Tower and Big Ben! Visit Gunwharf Quays and shop at over 90 designer outlets then enjoy a meal by the sea at one of 30 cosmopolitan bars, restaurants and coffee shops. Soak up the history with a walk along Portsmouth’s impressive waterfront, join a guided walk or self-guide yourself along the Millennium Promenade, taking in the Camber Dock, Round Tower and Square Tower. Continue along the seafront to find green spaces, impressive gardens and a range of activities. Attractions include the D-Day Museum – relating the story of the Normandy landings, Southsea Castle – built by Henry VIII, Blue Reef Aquarium and the Royal Marines Museum. Portsmouth also has a lively and diverse cultural scene. All year round there are city wide events and live entertainment – find live music, theatre and comedy in Portsmouth Guildhall, Kings Theatre and New Theatre Royal along with smaller independent venues. Here is a holiday in England which is truly different. Cruise through the glorious Cotswolds Severn Vale, visit fascinating destinations, relax in 4-Star comfort on the Edward Elgar Riverboat hotel and get a great value inclusive holiday from ONLY £195. The cruises take you to a new ‘port’ each day to explore the local sights or join an inclusive guided tour. There are pretty towns such as Frampton, Upton and Stourport; heritage sights such as Gloucester and Worcester Cathedrals, and a wildlife centre at Slimbridge. One cruise also includes an excursion on the Severn Valley Railway. The Edward Elgar offers comfortable cabin accommodation, delicious traditional English cooking and warm hospitality from the crew. The atmosphere is friendly, there is a well-stocked bar, complimentary tea and coffee and some live entertainment. The restaurant and top deck offer commanding views over the countryside and all inboard areas are climate-controlled. Enjoy England have awarded a 4-star Hotel Boat rating to the Edward Elgar for the past 3 years. English Holiday Cruises offer some of the best-value holidays in the UK in a package which includes the cruise itself, full-board accommodation, tea and coffee, guided tours, live entertainment, free views…..and great memories! Why take a river cruise holiday in England? Drive or take the train to the boarding point – no airports, no ferries, no passports, no crowds. Unpack once and take your hotel with you on a tour of the country. No repacking, no car, no fuss. Enjoy close-up views of the surrounding countryside and travel to new places every day. Step off to explore the local sights or join guided tours of pretty towns, heritage, wildlife and more. Get to know your fellow-passengers quickly – we have small complement of only 22 people. Enjoy every moment and relax – our crew will help you with everything. Book Early with Puma Hotels and save up to 30%! Puma Hotels’ Collection is the new British hotel group with 21 unique four star hotels across the UK. What makes Puma Hotels different is that they’re all – well, different. From Stratford-upon-Avon to Stirling, Torquay to Troon near Glasgow, Cardiff to County Durham, Puma Hotels give you an authentic experience of Britain’s unique and diverse landscapes, towns cities and coastline. And whichever you choose, you can be sure of a warm welcome and attentive service from our friendly, professional team. With the Puma Hotels’ Collection, you can choose the perfect atmosphere and ambience for your break, as well as the ideal location. Many of their hotels date back hundreds of years; a number were built in the Georgian and Victorian eras, while others are products of their own times. Each hotel has its own distinctive identity and architecture. Between them, their 21 4 star hotels have over 2,800 bedrooms and all have free WiFi. Their restaurants have won many awards, including numerous AA Rosettes, and many are regarded as destinations in their own right. And with 18 health clubs and 17 spas across the Collection, Puma Hotels have everything you need. They’re proud of the fact that so many of their 21 hotels are genuinely important historic buildings, with their own place in British history. So you can sit in the library where Shakespeare wrote As You Like It at Billesley Manor Hotel, near Stratford-upon-Avon. Dine in the room where Oliver Cromwell planned the Battle of Worcester at The Lygon Arms in the Cotswolds or stay in the ancestral home of a family who first came to England with William the Conqueror in 1066 at Walton Hall. Puma Hotels’ Collection offer a best rate guarantee and you can find the best deals on their website if you book 21 days before arrival where you can save up to 30%. This December Puma Hotels are giving away some great prizes from hotel breaks, shopping vouchers, Kindles and some Apple gadgets. Anglesey Bost Trips provide opportunities to experience Anglesey in a whole new way – departing from Caernarfon, Menai Bridge Pier and Felinheli. They provide Power Boat trips on 6 and 8 person RIBs with a fully qualified very experienced RYA Power Boat Instructor. With trips ranging from Wildlife tours to Puffin Island, to high speed rides throught the Swellies, Anglesey Boat Trips are great for couples, families and groups alike!